The city of Podgorica will host the first IPA DRAM Steering Committee meeting on June 12 and 13 to launch the Programme’s implementation. 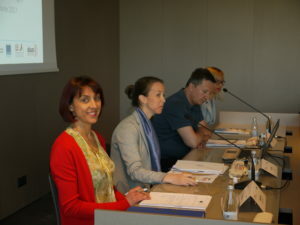 Taking place at Hotel Centre Ville and organized with the kind support of the Montenegrin Ministry of Interior, the Steering Committee meeting represents the first opportunity to gather IPA DRAM National Coordinators based in the partner countries, consortium members, delegates from the European Commission including DG ECHO and the Joint Research Centre (JRC) and key international stakeholders for the purpose of supporting as well as overseeing the overall progress of the Programme. Risks do not stop at borders. This is the reason why the Programme for Disaster Risk Assessment and Mapping (IPA DRAM) supports risk assessment through a cross-border and transnational approach in the Western Balkans and Turkey, especially by ensuring consistency in the methodologies, alignment to the EU regulations and to the principles of the Sendai Framework for Action as well as by promoting regional platforms for disaster loss data and risk mapping. Moreover, the multi-stakeholder approach is also reflected in the Programme governance, which aims at pulling together all the relevant authorities in the region alongside key international organizations to work together for more comprehensive results. After completing the inception phase which included country visits and fact-finding missions, IPA DRAM is now called to share its first results and propose the roadmap of its future actions. In the past six months a team of experts carried out several horizontal activities to better understand the local context regarding the major and emerging risks present in the region as well as the national state of play on disaster loss data and risk mapping. The collected information resulted in country specific desk studies which are going to be presented during the 12-June-meeting. The Steering Committee meeting will be followed by the Regional Workshop “Levelling-up” from 13 to 15 June. This event is expected to pool appointed national experts on risk assessment, disaster loss data and risk mapping from each partner country. Sessions covering all the Programme’s technical components will focus on exchange of good practices, discussion and understanding of regional needs and gaps. The workshop, which will include keynote presentations by experts from the Programme’s Consortium, JRC, DG ECHO and UNISDR, is part of the set of capacity building activities promoted by IPA DRAM to support and guide national authorities in the Programme’s implementation. This website has been produced with the assistance of the European Union. The contents of this website are the sole responsibility of the IPA DRAM PROGRAMME and can in no way be taken to reflect the views of the European Union.